For the latest news and events from WCALP, please visit our WCALP News page. We work to assure that Westmoreland County farmers have sufficient land to provide the agricultural products needed by the County and the Commonwealth. 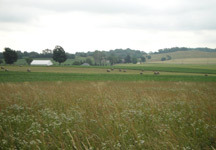 Agricultural Security Areas and Agricultural Conservation Easements are two of the tools used to preserve the County’s rich agricultural heritage. Our long-term goal is to permanently preserve farmland, and you can help lead the way. Buy locally produced agricultural products. Support your local farm markets. Teach your children where their food comes from. Encourage your locally elected officials to support the protection of our valuable farmland. Consider protecting your farm through an agricultural conservation easement. The Westmoreland County Agricultural Land Preservation Program was developed in 1990 to conserve and protect agricultural lands and assure that farmers in this County have sufficient agricultural lands to provide farm products for the people of Westmoreland County and the Commonwealth. The Westmoreland County program has been approved by the Pennsylvania Department of Agriculture, and operates within the guidelines of the Agricultural Security Areas Law (Act of June 30.1981, P.L. 128, No.43). Our Mission is to protect viable agricultural lands by acquiring voluntary agricultural conservation easements, which prevent the development or improvement of the land for any purpose other than agricultural production. Encourage landowners to make a long-term commitment to agriculture by offering them financial incentives and security of land use. Protect farms in agricultural security areas from incompatible non-farmland uses that may render farming impractical. Protect normal farming operations from complaints of public nuisance against normal farming activities. Assure conservation of viable agricultural lands in order to protect the agricultural economy of this Commonwealth. Provide compensation to landowners in exchange for their relinquishment of the right to develop their private property for any use other than agriculture. Maximize agricultural conservation easement purchase funds and protect the investment of taxpayers in agricultural conservation easements. Use available funds to obtain maximum agricultural conservation easement acreage. Please feel free to Contact Us with any questions you may have about agricultural land preservation in Westmoreland County, or concerning our Agricultural Security Area and Conservation Easement programs.